During February, four exclusively invited organisations will replace their old system and shift over to Impactpool’s recruitment system. Imagine a recruitment system built for international organisations and impact companies that costs from $55 per month and takes less than 2 hours to set up. 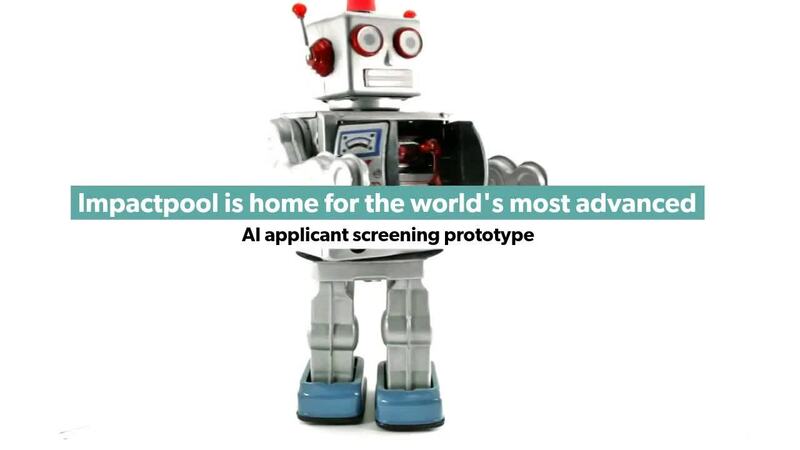 With a growth of 50-100 new organisations per month using Impactpool’s service and with AI screening soon to be launched, it is a fair to forecast that the recruitment landscape will change dramatically over the next few years. The business of Recruitment systems have not yet faced the business disruption that many other sectors have. Large companies are still selling hard-to-implement, user-unfriendly and expensive recruitment systems, that don’t even fit the Impact business they are intended to support. Impactpool’s vision in this area is clear - every impact organisation should use the same recruitment system, it will make life easier for talents and increase the speed and quality for the hiring organisations. This vision will be achieved by offering a recruitment system that comes with the best talents and with a price that every impact business or organisation can afford. “We believe that harmonised recruitment systems will provide better talents. Talents know where to go to find jobs, it will finally shorten the recruitment timelines and get the most qualified talents deployed to jobs that make impact” says Magnus Bucht CEO of Impactpool. Have a price tag that is fair, reasonable and that gives you the possibility for you to pay for the recruitment system only when you use it. The Impactpool recruitment system (Impactpool ATS™) is a cloud-based system built for International recruitment. Other recruitment systems available on the market is built for local private sector recruitment, it is rare they include contract types, contract grades, duty stations etc and other stuff that are prerequisite for the impact sector. “We looked at the gaps in current recruitment systems and built one that is focusing at what organisations need the most, this is an invitation only release. We are now working on our AI Screening Algorithm, so when we open up the system for a wider audience in 2020 our ATS will be self-screening candidates” says Magnus Bucht, CEO. This month the following four organisations go live - IDLO, JRS, WeEffect and ViSkogen. Impactpool has close to 400’000 talent profiles and as soon as any of the 4 organisations that post a job, the Impactpool AI algorithm will match the job to suitable talents and notify with a job alert. This is the start of the future when it comes to recruitment.